Accurate determination of the flow rate through pneumatic devices and components is essential to the design and optimization of industrial equipment using these components. Indeed, the complexity of current approaches remains a barrier to their understanding, therefore, their generalization. This issue often occurs in pneumatic power transmission and also in the compressible fluid control valves. It is however important for all the users to be familiar with the methods used to determinate the flow rate characteristics of the installed devices. A theory taking into account the compressibility of the fluid was developed in several prior works; they allow characterizing the flow through any device by considering the choked and the unchoked flow. The methodology developed in the literature needs at least two coefficients: critical pressure ratio and flow rate coefficient. 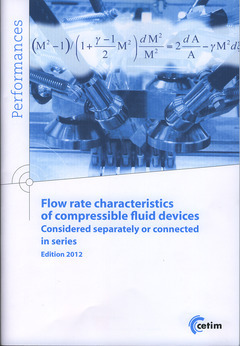 From a theoretical development, and subsequent simplified theory, this publication (9Q193) provides a simple method to calculate flow coefficients and the critical pressure ratios for all pneumatic components condidered separately or as an assembly, in compressible fluid when the flow is assumed to be adiabatic. An exhaustive experimental study is conducted to verify the assumptions made here and validated the theoretical results.